This is my latest acquisition. 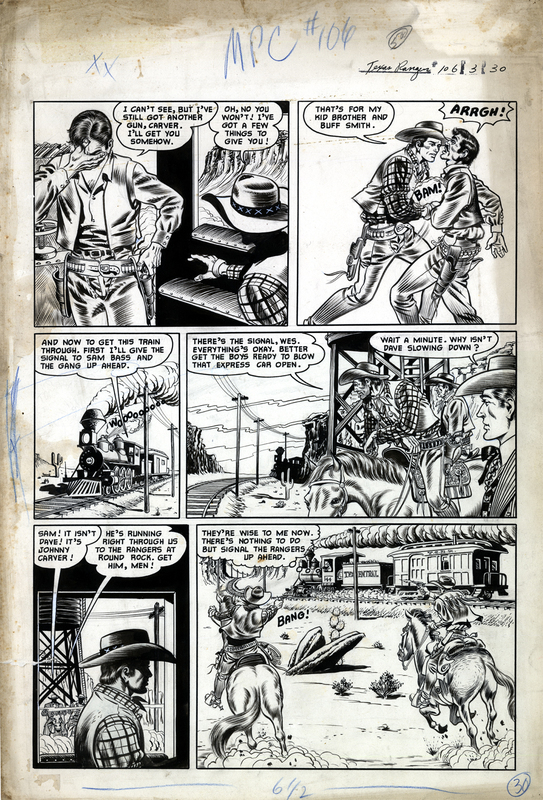 It is page 30 from Motion Picture Comics 106, adapting Columbia Picture’s Western drama, “The Texas Rangers”, starring George Montgomery and Gale Storm. The comic was published by Fawcett Publications in 1951. The artwork is “attributed to Bill Ward”, by Heritage Auctions, where I made the winning bid on December 26, 2016. The hammer price was $130.00. I feel that I got a bargain. Heritage had been auctioning off a page a week from this book for the previous month prior, and I had let all of them slip through my fingers. Oh well, one can’t buy everything. 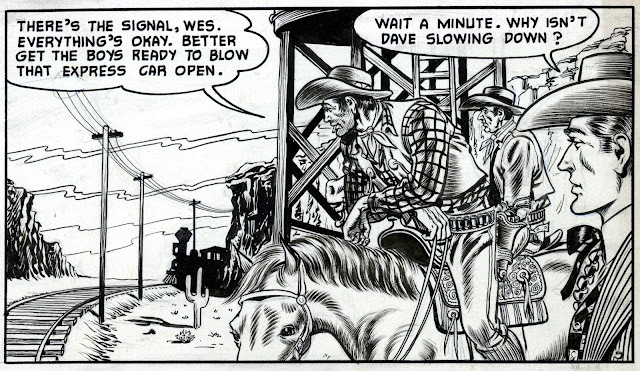 In my opinion, Ward's pages for this book compare favorably to then-contemporary work by the team of Severin and Elder. Bill Ward’s Wikipedia bio says that he took over the “Blackhawks” comic from Reed Crandall; I can believe it. He seems like a good stylistic fit. 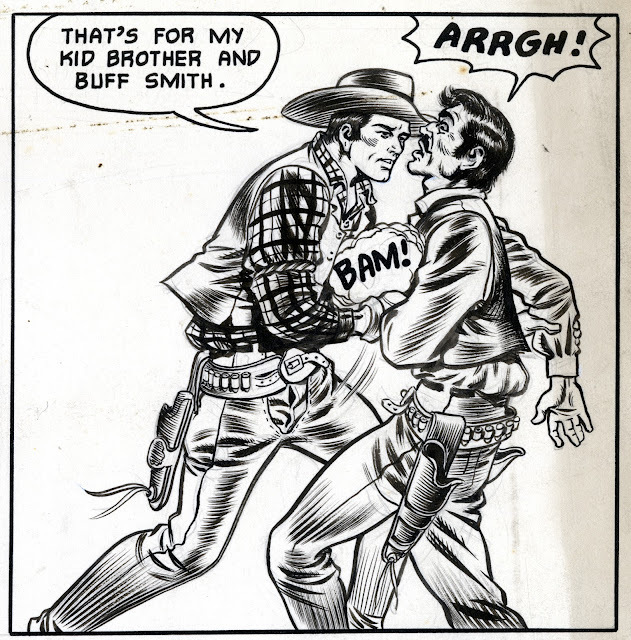 It’s trip to think that this book was illustrated by Bill Ward, mostly known for his “gird girl” art on “Torchy” and “Humorama” from the mid-50’s onward. 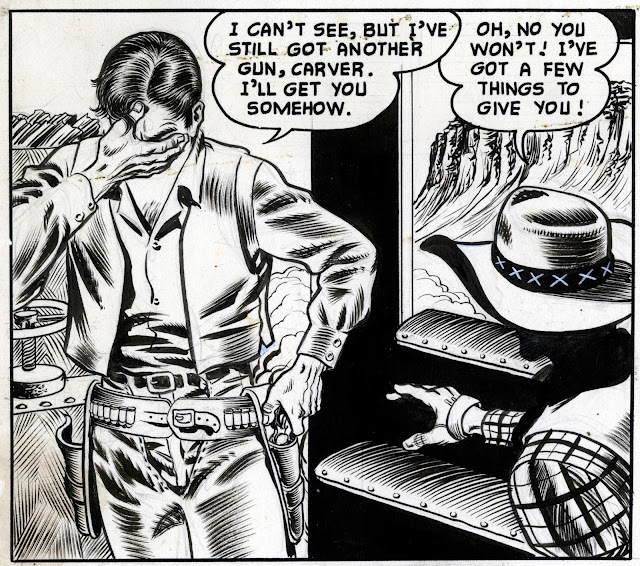 Panel 1: The pose on the man on the left looks like early 50’s John Romita Sr. I really like the inking on this figure, especially the way rim lighting is subtly suggested. I love the subtle use of dry brush, especially on the chaps. Panel 2: I’m not wild about the posing but, again, I really like the inking, the way back/double lighting is subtly suggested in the modeling of the drapery and the occasional use of dry brush. Panel 3: Yeah, it’s a train, whatever. Yawn. The inks for the background elements aren’t as good as on the figures, so panels like this suffer. Panel 4: Cool composition, good use of eye-read. The inks on the figures are great, the BG elements less so. Nice dry brush on the horse. But those BG cliffs are gnarly. 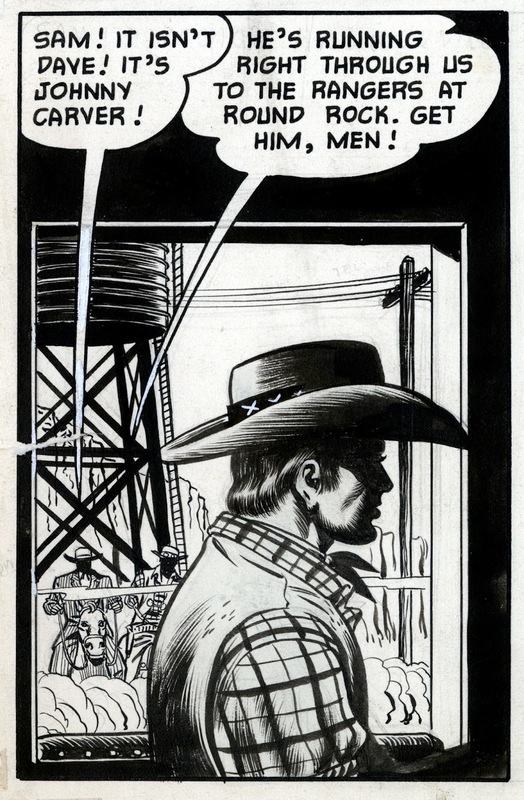 Panel 5: Cool panel, great composition. It would make a cool postcard. Panel 6: Hmmm. Cool is some ways. Good composition, but needs tweaking. 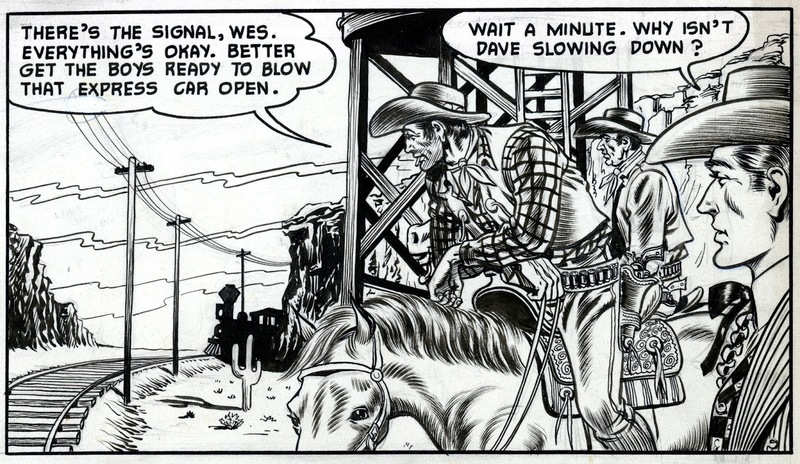 The left gunman’s gun disappears into the train’s cow catcher. 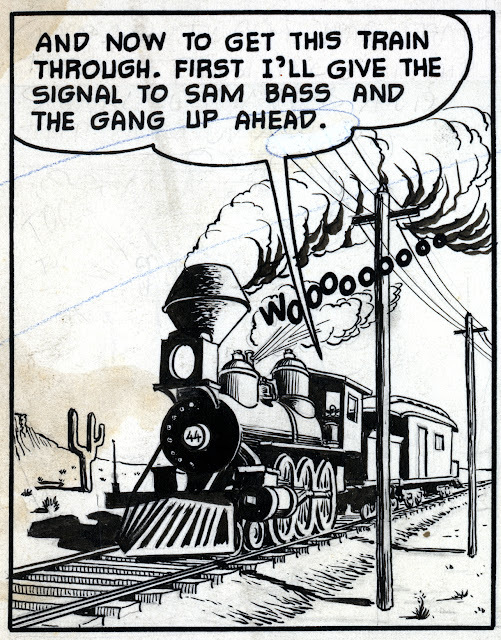 The inks on the BG train are more dynamic than the FG horsemen. 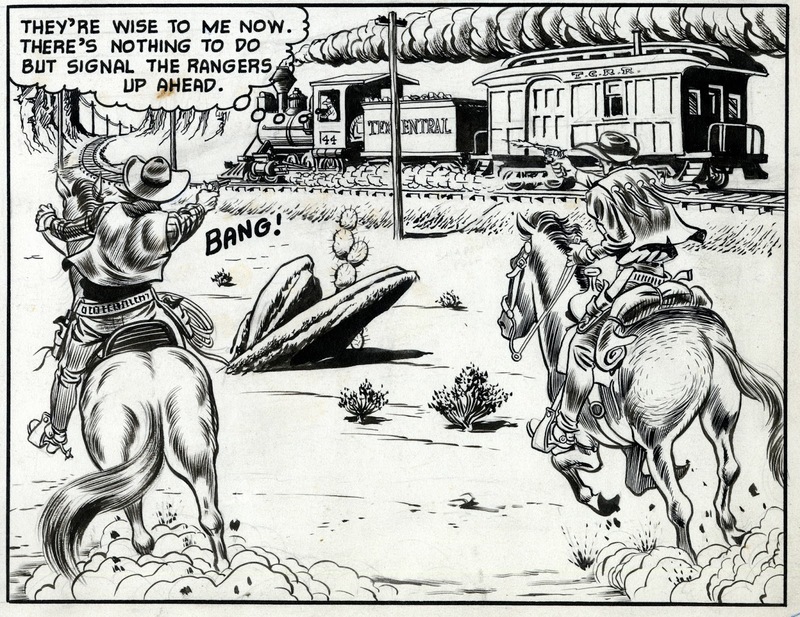 Ditto with the rock/cactus grouping in mid-panel; more dynamic than the horsemen. Nice inks on the horse haunches though. Oh well, I guess Ward isn’t as good as Severin and Elder. Still, there’s many things I like in this page.